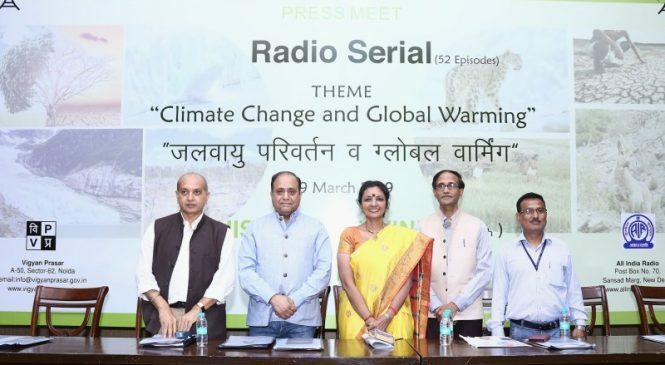 Vigyan Prasar Director Dr. Nakul Parasar, Deputy Director General of AIR Delhi Ms. M. Shailaja Suman and other dignitaries during the launch of Radio Serial on the theme Climate Change and Global Warming in New Delhi on 29 March, 2019. To create awareness on the issue of global warming and climate change, Vigyan Prasar, an autonomous organisation under the Department of Science & Technology, Government of India and All India Radio have jointly launched a radio-serial. The transcripts of the radio serial can be read by clicking here. Last updated by DG Correspondent at April 3, 2019 .